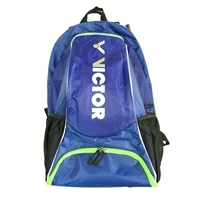 Lightweight and economical, the Victor BR-6202 sports bag can easily hold up to 6 rackets in 1 of it's main compartment. 1 more main compartment for your clothing. Large top-load shoe compartment. 1 front compartment for your accessories. All compartments is fitted with zipper with metal buckles for durability. Padded single shoulder strap. 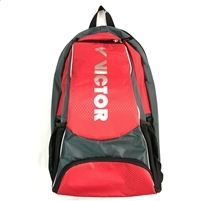 The Victor AG-010 sports backpack has 1 large main compartment that's perfect for all your clothing, water bottle, etc. Also great for students who needs to carry school work with them. A built-in organizer pouch can neatly arrange your pens and notepads. There are 2 main compartments for rackets and clothing, 1 shoe compartment with a ventilation hole, and 1 large front accessory compartment that has built-in organizer pouches.